LOS ANGELES, CA -- (MARKET WIRE) -- October 11, 2005 -- Everyone has their image of the perfect house, but when it comes to buying a home a new national survey released today found there is something even more important than finding one's dream home: finding the right neighborhood. The survey reveals that nearly three out of four (72 percent) Americans consider the neighborhood first -- even before thinking about the house. While just as many (73 percent) would give up their dream home in order to live in a great neighborhood. The survey also found that 92 percent of respondents believe that location is everything when purchasing a house. The independent national home buying and selling survey was conducted by national research firm Kelton Research in August 2005, and sponsored by HomePages™ (www.homepages.com), the first national home buying and selling service to combine aerial maps, in-depth neighborhood information, and nationwide home listings into one Web site. The survey included 800 interviews with home buyers and sellers 25 years of age and older. "Home buying is about more than just the house; it's about what makes a house a home and the proximity of a home to schools, parks, restaurants, and services," said Ian Morris, the CEO of HouseValues, the company that developed HomePages. What Neighborhood Factors Matter Most? 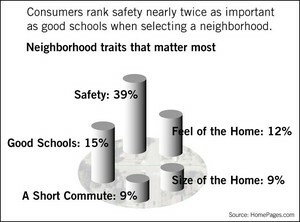 Thirty-nine percent of consumers polled rank "safety" as the number one factor when selecting a neighborhood, nearly twice as important as "good schools," and three times more than the "feel" or "amenities" of the house itself. Of those surveyed with school-aged children, "good schools" is the single most important factor in a potential neighborhood -- nearly seven times higher than ranked by "empty nesters" (five percent). They also value schools six times more than the "size of the home" and five times more than the "feel" or "amenities" of the house itself (six and seven percent, respectively). Finding a home is a significant investment of money as well as time with the average homeowner visiting 12 houses before deciding to buy. The survey also found that 92 percent of Americans stated that being able to search for and compare homes and neighborhoods on the same site would save them a lot of time. Owning a home is an important aspect of the American dream and the survey found that Americans who have managed to achieve it are quite proud of their home ownership: more than two thirds (67 percent) of them make improvements to their house not to add value, but to improve their living environment. The survey also revealed what Americans like best about their current homes -- 25 percent said, "peace and quiet" is their top desire. On the flip side, not coincidentally, noise and crowding (14 percent combined) topped the list of complaints consumers have most about their current neighborhood. With so much happiness involved in home ownership, the survey found that those consumers who do not yet own homes are clamoring to join the ranks of those who do. Approximately 25 million Americans say they would like to buy a home in the next year, and one in three will be first time home buyers (30 percent). More than a quarter of those who plan to buy a home in the next year are under the age of 30 (28 percent) and nearly half are under 40 (45 percent). According to the survey, more than half American adults (54 percent) believe we are in a sellers' market. Meanwhile, more than three out of four (77 percent) believe home prices will continue to rise, indicating that it may well be a sellers' market, but there will never be as good of a time to buy as now. HomePages™ (www.homepages.com) gives consumers a complete picture of where they want to live in a way they have never seen before. This lifestyle and neighborhood-centric site combines detailed neighborhood information (community demographics, crime stats, school details, parks and recreation, and local amenities and services) with searchable aerial imagery and integrated home listings to help consumers make the best decision about buying or selling a home. HomePages was developed by HouseValues Inc. (NASDAQ: SOLD), to provide consumers and real estate professionals with the information and tools they need for success throughout the home buying and selling process.